I wrote the following article for a TV show I was featured in (for about 10 seconds) a few years back. They asked for a brief sketch of the evolution of armour and weapons throughout the ages to guide their own research on the topic. This is a very generalized history and viewed mainly from a western perspective, but it might be useful to students. As a generalization we can look at people in the early Stone Age as people using whatever means they had at their disposal to survive. The “naked ape” didn’t have the thick skin or fur, fangs or claws to hunt or defend himself. He was however a resourceful tool user, and used whatever stick, stone, horn or antler at his disposal to dig up, bludgeon, stab or whatever, to procure his next meal for him and his loved ones. These tools/weapons where also useful to dispatch any human or humans who threatened this poor wights family stability or has someway offended him. Sticks or stones do break your bones when swung with sufficient velocity. Early man learned this lesson well. It was also discovered that the animal skins and woven plant fibers while providing insulating warmth and protection against the elements, also provided a pretty decent protection against the sticks and stones flung by his hostile neighbor. Hence the first armour tended to be heavy padding in the form of animal skins and fiber “mats” to repel the hack or slash of Stone Age weaponry. This is the beginning of an arms race which continues to this day. At sometime and somewhere in our very distant past (A very hotly disputed topic) but probably somewhere in the Mediterranean valley, perhaps as early as 3000 BC a substance was first discovered. Maybe accidentally found in a potter’s kiln when certain rocks oozed a peculiar substance under extreme heat. In any event, people discovered that they could melt this unique material from certain rocks and this material possessed extraordinary qualities. Malleable and castable, this new material allowed craftsman to fashion tools, hardware and weapons in an unheard of method. We had entered the copper age, the first of the metal ages. Copper is incredibly malleable but has a tendency to work harden when beaten at cold temperatures, a definite asset when putting an edge on cutting tools. Certainly not superior in all ways to obsidian or flint, copper did however possess certain advantages over stone tools. When work hardened, it could produce serviceable tools and weapons; knives, axes, chisels and spears, while they did not produce the incredible razor edge of obsidian or flint, it did however produce tools and weapons much less brittle. 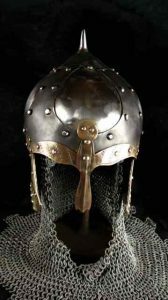 It was also discovered that copper could be beaten into sheets to produce items like pots and pans which of course led logically to the first experiments with helmets and body armour. While revolutionary to Stone Age culture, copper possessed a few serious drawbacks such as extreme weight and softness. Also the extensive labor to smelt, cast and forge copper into useful items, made full scale exploitation of copper impractical. Over the next centuries copper was experimented with by entrepreneurial visionaries. Later, other metals where discovered in different rock structures. Eventually it was found that mixing copper with tin, produced a whole new metal called bronze. Bronze, an alloy, exhibited some exciting characteristics. It was lighter and stronger than copper and could be cast at a lower temperature. The lighter, tougher, harder bronze hearalded in an era of tools and weapons which far outstripped the advantages of stone and copper. This improved weaponry begged the need for improvements in armour. Indeed,this age saw the emergence of prototype armour of all forms yet to come. As a simplification of the Bronze Age we could look at Ancient Greece. The Greek hoplite wore a solid plate cuirass (breast and back plate) of bronze ,along with greaves (shin guards) and a full faced helmet. With the addition of a large shield, this armour provided an excellent defense for its age. As mankind entered the Iron Age, he soon discovered a material much superior to bronze, especially in the area of tools, weapons and armour. It was quickly discovered that adding carbon to iron increased iron’s hardness to heretherto unseen levels. This carbonized iron became known as steel. Additionally, iron and steel was significantly lighter than bronze, a definite plus for both armour and weapons. Probably the most famous Iron Age culture would be the Romans. The roman army borrowed armour and weapons knowledge from cultures like the Greeks and Etruscans. They transferred this knowledge into a formidable military style which allowed them to conquer virtually all of Western Europe. 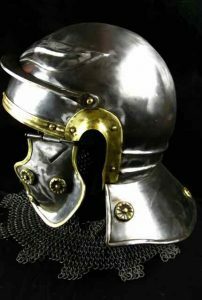 The typical Roman soldier wore an open faced steel helmet with cheek plates , a cuirass( usually consisting of mail early on but increasingly changing to lamellar plate or solid breast plates in the latter era of the empire) sometimes greaves, and a large rectangular shield. The roman soldier fought with a short sword (approx 20” blade) and their large shield. Locking shields into a “shield wall” the warriors of Rome where able to advance upon their enemies thrusting over their portable wall. This strategy was extremely successful for Rome and contributed greatly to there military expansion. The Roman Empire eventually collapsed in Western Europe, it’s remnants taking on a different form in the east (Constantinople). The next five hundred years are known as the Dark Ages. This refers to a comparative lack of industry, trade, exchange of information, cultural sophistication etc. In Dark Ages Europe, isolated tribes and villages were forced to be largely self sufficient. This meant it was difficult to specialize in any one product. The raw materials, tools, craftsmen, sub trades where all very rare. For armour, this meant a simplified imitations of Roman armour. 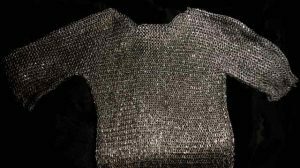 Simple, open faced helmets of iron, bronze or leather, and chain mail shirts for the very wealthy comprised the typical outfit. 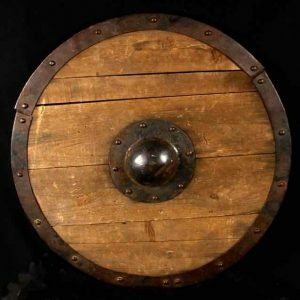 Shields tended to be smaller then Roman shield, usually round. Swords tended to get significantly longer. Vikings were a popular culture of the dark ages. Growth of urban areas, with the increased trade and industry provided the frame work for Medieval Europe. With increased mounted warfare a new class of warriors emerged. From the creation of the Feudal system, came the Knight. These mounted knights were able to carry more armour and increased industry provided more mail, allowing for the introduction of, mail leggings, hoods,and mitts. Helmets tended to get bigger with extra pieces added until eventually they covered the entire head. These helmets were called (oddly enough) “great helms”. Clad from head to toe in mail, this style of armour remained largely remained largely unchanged for the next 200 years. Chain mail, while been flexible and good defence against cuts was perhaps too flexible. Blunt trauma was a huge problem for crusader knights. A heavy sword blow could produce broken bones and internal hemorrhaging without even damaging the mail. Heavy padding underneath was one way to solve this problem but reduced mobility and increased danger of over heating, a real problem for European knights fighting in the holy lands. Helmets had always been made of plate armour and it was observed that plate pound for pound provided a superior defence over mail. Swords and other weapons tend to deflect off or bounce off plate armour with virtually no damage to the armours wearer. With increased industry and specialization, plate armour again became a viable option something not really possible in Western Europe since Rome. 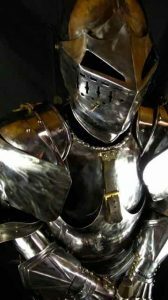 The difficulty with plate armour is how to create a suit flexible and light enough to provide the mobility to rival and finally eclipse chain mail’s effectiveness. The transitional era saw, over the course of about 200 years, the introduction of plate defenses like elbow and knee caps, strapped over chain mail. As plate evolved several techniques were employed to provide plate on plate articulation (pivot points, sliding rivets hinges and straps). By about 1450 plate had progressed to such a level as to make the chain mail underneath superfluous. They now had a knight clad from head to toe in articulated plate, lighter than full chain mail and considerably more comfortable and mobile. The next hundred years represented the golden age of armour where increased refinements such as fluting made this armour lighter yet stronger, and subtle design changes made any gaps ever smaller and better protected. By the 1500’s, muskets and cannons had continually improved to the point that armour became increasingly less effective. The gun had been around for a few centuries but up to that point had not been reliable or powerful enough to make a serious impact. Breastplates became thicker for a while but muskets ever increasing power soon outstripped plate armour of any practical defensive ability. So war are moved away from heavily armored knights locked in close combat, to a more spread out, gun oriented combat. As armor’s effectiveness decreased on the battlefield its popularity increased on the tournament field. By this point in history the tournament had become a highly specialized sport. It’s armour had evolved accordingly. Where early tournaments often involved knights in fights to the death, eventually it focused more on the illusion of danger and violence. Quasi professional athlete knights toured medieval Europe. Jousting armor sacrificed mobility to create a safer more solid defense against and oncoming lance. Lances were designed to shatter on impact and breast plates were created with spring loaded contraptions. These would produce the illusion of flying apart. A theatrical device similar to the flash and glitter of today’s so called professional wrestling. Parade ArmourAnother side branch of armour was parade armour. Traditionally victorious armies marched through the streets of their home towns with all the pomp and pageantry possible to inspire awe in their community. Wealthy nobles constantly vying to “one up” their peers began to have special armours built just for parade. These suits became less practical and more and more decorative. Garish, outlandish designs emerged, demonstrating the artistic and technical expertise of individual armourers .Because these suits were so expensive and never “saw action”, many examples have survived to the present day. This is a generalized sketch of the rise and fall of the armour age. An infinite number of factors affected armour styles. Expense, weapons, cultures, fashion, religion, and climate were all factors that affected the type of armour seen at any given time or place in history. Armour should be seen as a compromise between protection and mobility ,providing maximum defense, while still allowing maximum movement, sight and “breathability” for the given situation. Addressing this paradox has been the definitive goal of armour throughout history.